This peace pipe is made with a polished buffalo horn and wood pipe stem. Overall, this buffalo horn pipe is about 18" x18", including the leather hanger strap and feathers. The buffalo horn bowl shown is representative. Coloring on individual horns will vary from solid black to black with white patches, usually at the top of the horn. 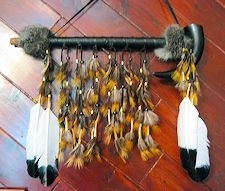 (See the buffalo horns in our craft section for more examples.) The outside of the horn is polished to a high gloss shine. The stem of this pipe is wrapped with black deerskin leather and has two gray rabbit fur wraps. .
Each fringe has silver or brass trade beads and glass crow beads and is tipped with a silver or brass cone. The fringes are decorated with golden pheasant feathers. There are also four large simulated eagle feathers. We make this artifact replica especially for you when you order it, so allow about a week for construction time, plus shipping. If you have a preference on the crow bead color, (shown in black), leave a comment in the comment box on your checkout form. The buffalo symbolizes abundance. The rabbit totem is an instrument of magic and good luck. He brings success and a good attitude to all endeavors. Rabbit is also a symbol of reproduction and abundance. The lesson is to create joy and faithfulness within our friendships, and go forward with anticipation. This product was added to our catalog on 09/14/2012.